Back to my new stage. I regularly go through stages. They keep life new and exciting. My new enthusiasm is for a high-fibre diet. I have been through a high-fibre diet phase before (I even have a cookbook called Natural Fibre Cooking) but that was many years ago when I was young and enthusiastic for all things alternative. This stage is a result of watching the last two episodes of Catalyst. For those who don’t know, Catalyst is a TV program on the ABC. New research suggests that our current eating habits could be making us sick. In fact, our diets might be contributing to heart disease, cancer, asthma, allergies, arthritis, autism, depression, multiple sclerosis, diabetes, etc. Now, we’ve been hearing for years how we should be eating healthy food. But this research explains why. It’s all about the bacteria that live in our intestines. It turns out we are home to many trillions of bugs. Eat good food, you end up with good bacteria. Eat badly and you get bad bacteria and there seems to be one main culprit – our low-fibre diet. A lot of research is now pointing to our low-fibre diet being largely responsible for that long list of diseases. It seems our gut bugs have an enormous influence on our health. The show suggested that you can extend your life span by years, if not decades, with a healthy diet. Research into a nomadic hunter-gatherer diet indicates that the people eat five to ten times more fibre than us in the West. Our low-fibre diets, antibiotics and Western ways have left us with very low diversity in our gut bacteria. But there is good news. Your gut bacteria community can be altered. I have been nibbling on nuts and seeds since I saw the shows. “Where does this all lead?”, I hear you ask. To today’s recipe, of course. In the circumstances, wholemeal bread with some seeds in it was called for. I fed my starters last night but because I hadn’t decided what I was going to make, I didn’t soak any seeds or grains. Normally, if making a loaf like this, I would soak whole linseed (flax seed) overnight. As this hadn’t happened, I decided to grind the linseed and soak it for as long as it took to have a coffee and get the ingredients together. Either pursue this technique or soak whole linseed (flax seed) overnight. This recipe is based on Yoke Mardewi’s multigrain sourdough bread from her book, Wild Sourdough. approximately 400g rainwater or filtered water (extra). Hold some back and add as much as you think you need. Flours are different so it is hard to know exactly how much you will need. The shows were very interesting. If you missed them, you can see them on the ABC website or on ABC iview. This entry was posted in Bread, Sourdough and tagged Calalyst Gut Reaction, Flax seed sourdough bread, Gut bacteria, High fibre diet, Linseed sourdough bread, Vinegar as a medicine, Vinegar is good for you by Glenda. Bookmark the permalink. We’re doing the same thing. The only thing different so far is that I’m walking the spots off the floor on the way to the loo. 🙂 That’s got to be good. Maureen, it hasn’t affected me that way. I am just singing like a bird, chirp, chirp! It is all those seeds. If only there was wider access to genuine nutitional information such as you share rather than corporate nutritionism with an eye to shareholder profit. When I see ads for “nutritious” “healthy” or other faux “remedial” foods it makes me cranky. I hate the opportunism at the expense of people’s wellbeing. Hi Ella, did you what the show, “The men who made us fat” That was very interesting and enough to make you really really cranky. We just watched these two episodes of catalyst tonight. It was very interesting, and in some instances surprising. I couldn’t believe how badly the young gymnast ate at the beginning of the insulin trials. Not much will change here, though on the whole we eat pretty well! Hi Sandra, I think a lot of people east like that young gymnast. The amazing thing was he was an athlete, he should have known better. We eat pretty good here too but you can always improve. I definitely agree with you that our gut flora has a large impact on our overall health. I actually think that the excessive use of refined sugars in western diet is a major culprit. Everything in moderation of course…I’m not saying that you can never have a treat, but too many children and adults are eating too much sugar everyday. Hi Laila Absolutely, especially in the form of processed food and cool drinks. How did it get to this? It was an interesting show wasn’t it Glenda. Although I had to laugh over the ‘new research’ aspect. Some researchers have been suggesting this point of view for up to 70 years. But modern medicine finally decided to check it out 🙂 I actually thought of you when they mentioned the vinegar. I might now have to look at making my own. The other thing you can do to increase your good bacteria is increase your consumption of fermented foods. Vinegar is absolutely one but cultured vegetables and drinks will also help boost your good gut flora. Beautiful loaf! Hi Tania, I did wonder why they didn’t mention fermented food. I was eating high fibre in the 70’s. IO must have been ahead of my time. Wow, that’s a lot of information to take in but I’m not at all surprised about a link between fiber & various diseases. It makes perfect sense to me. I’m very curious about the link w/vinegar though and inflammatory diseases since I’ve been diagnosed w/MS and have arthritis in just about every joint….well, not the new hip of course. I just don’t think I could down a spoonful of vinegar though -maybe more salads. I think Mary Poppins said it was a spoonful of SUGAR makes the medicine go down. Very Interesting Glenda. I heard about this show and must catch up with it. In the meantime I enjoyed reading about your approach to the loaf of bread. My new stage invloves making bread ( thanks to Celia) so I am keen to read all your bread recipes. You probably know this with vinegar, – it can make your teeth turn yellow so brush after the vinegar dose. Like you, I followed whole grain cooking back in my younger years and as I have got older, things may have become too refined. I must see that show. It makes sense that the food we eat affects our health but the problem is that today’s super health giving food is tomorrow’s toxic food. Everything in moderation is my motto. Your bread looks nice and airy – hope it tasted as good as it looks. Hi Anne, the bread tasted bloody good. As long as I have been an adult the advice has been to eat more fruit and vegies and more whole food. It is doing it that is the hard part. I don’t eat much processed food so that is one plus in my favour. I am sure our health is determined by what we eat. We watched both episodes of Catalyst too, Glenda, with huge interest… particularly as I had recently bought a bottle of apple cider vinegar with ‘mother’. I’ve been drinking it in water in the hope that it might help boost my immune system… not sure, yet, I did start to feel a little unwell, so I have cut it back to two or three times a week rather than daily doses. 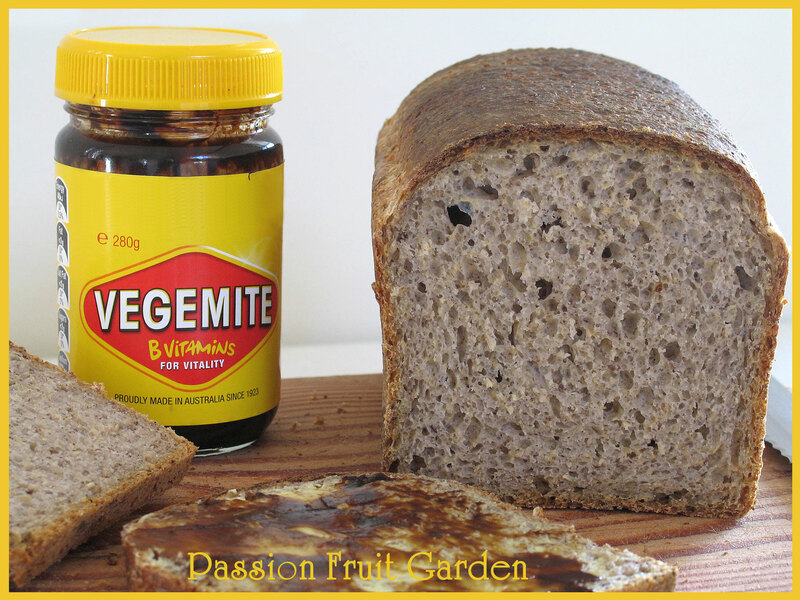 Your bread sounds divine and the vegemite did catch my eye… I’m trying not to eat too much in the way of grains, as I find they do affect my health… we’ve embarked on a new stage as well… the 5:2 eating plan… so far so good. Thanks for sharing this interesting post.